The Search Engine Land site had a post on Jun 29 2009 - Google: We’re Not Really That Big But If We Are, We Aren’t Bad - where charts were used; specifically, charts that Google has used to argue that while it may appear to be a big company, it is not that big when compared to some of its peers, or in relation to the size of the market itself. 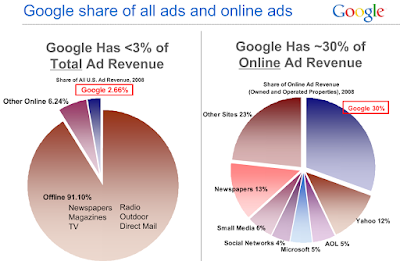 Let's start with the Google pie chart, which tries to highlight the diminutiveness of Google's market share. The first one is a simple vertical bar chart, while the second one is a stacked percentage vertical-bar chart. Since we are working with percentages, either chart is conveying the same information. The data in question for Google is called out by the use of a different color, and the size of the data is made clear by the height of the 'Offline' bar. Even in comparison to the 'Other Offline' bar, the Google bar's size pales in comparison. Adding a data label may seem redundant, but if the chart does not support hover tooltips, then adding the label, with the precise value of the series, helps. 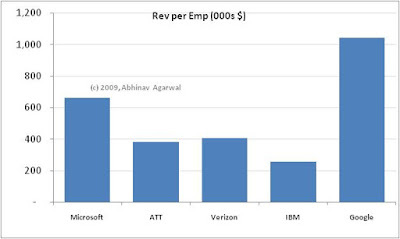 Here the attempt is to compare each company on two variables - revenue and employees. A dual-Y-axis bar as the one used above is not good, not good at all, for such a presentation of data. What exactly is the point of plotting revenue and employees as bars in this graph?A line-bar maybe, but even that is sub-optimal IMO. If you have to do this type of a comparison, the scatter plot is most effective since it allows for a meaningful comparison across companies too. To make this interesting, you could also add a third variable, and plot the data as a bubble chart. You could also use a butterfly graph. When displayed as a vertical bar, what is obvious is that Google has much lower revenue, and even fewer employees when compared to any of the companies it is being compared with. Fair enough. But what the chart does display, but not tell you very clearly, is something very interesting, that I explain with charts below. Google's per-employee-revenue is more than one million dollars (say it Dr Evil style and it doesn't sound as sinister, maybe funnier), while IBM is less than a fourth as much at $254k per-employee, and even Microsoft is only $600k per-employee. What this tells us, as long a we are comparing these companies, is that Google is able to eke out a lot more revenue from its employees than other companies. Unless its employees are super, super-freaks, it can mean, among other things, that Google has achieved economies of scale far beyond its peers, like Microsoft, IBM, AT &T, and Verizon. 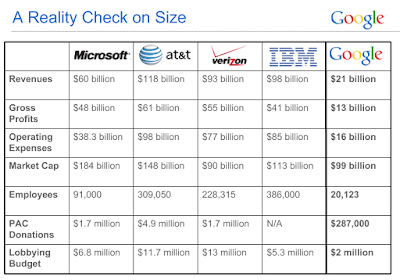 In some ways it can also be an apples to oranges comparison, because the businesses that Google and ATT and Verizon and IBM are not exactly comparable. But, this is the set of companies that accompanies the post, and is also the set of companies that Google chose. So there. If you were to do a similar comparison with Microsoft, taking only its Windows and Office divisions, that have a near-monopoly market share in their respective segments, I am sure you would come up with near-Google numbers, or maybe even better. Conjecture, but a fascinating one, IMO. If you accept Google's proposition that the other companies in the comparison are in similar businesses as Google, or that they are competitors to Google, then you also have to accept the proposition that revenue-per-employee figures also should be similar. If they are not, it could be because the companies are diverisified into areas where such economies of scale do not apply; which is a fair argument to make, or that these companies are just not able to extract as much money as Google is. Let's use another ratio. This time, I use market cap-to-number-of-employees as the ratio. Why use this ratio? What does this tell us, if anything? Well, for one, market caps are fairly fickle numbers, and can be misleading. But since the data is from the Google table, let's use it anyway. What it may tell us is how valuable each employee is to Google's shareholders. Simplistically speaking, each Google employee adds $5 million to the company's market capitalization. That is more than twice Microsoft's. That is more than sixteen times IBM's. Again, assuming Google's employees are not all hyper-efficient Einsteins, and some or even many would argue that is indeed the case, it means at the very least that Google's hold on the business and industry it operates in is a lot more efficient and powerful than its competitors. Which could result from, among other things, near-monopoly pricing power. Let us use a third set of metrics, and this time, let's also plot a bubble chart, that can display three measures reasonably well. 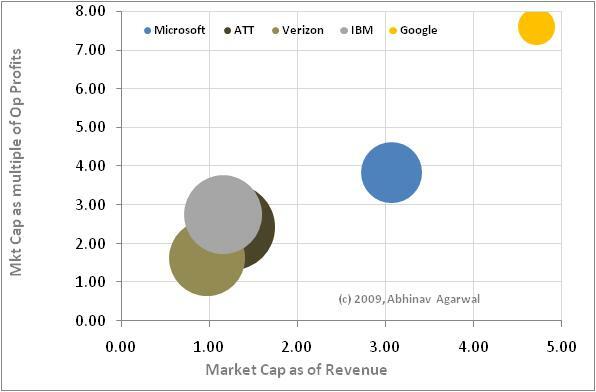 What is plotted on the x-axis is market cap as a multiple of revenue. i.e. for Microsoft, the bubble in blue, this would be 184 billion (its market cap) divided by 60 billion (its revenues), to yield a figure of 3.07. And similarly for the others. 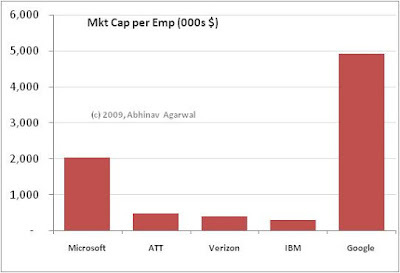 What is plotted on the y-axis is market cap as a multiple of operating profits. The size of the bubble is the company's revenues. Firstly, that Google plots as an outlier. Good outlier or bad outlier? Well, that depends on whether you are Google or its competitor. It also tells us that Google's price-earnings ratio is way out of whack with its competitors. It could also mean that Google is incredibly over-priced, or that it has such a strangle-hold on its business that giant gains in market share, and consequently revenues and margins, are almost guaranteed over the coming years, which is why the market has driven up its market cap to such heights. From Google's perspective, unless it intends using the currency of its market cap to make big-ticket acquisitions, such a high market cap is not really that good. It only attracts market envy and unwanted regulatory attention. Anyway, another example of how data can be used to show some and hide some.